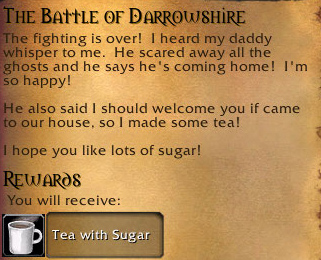 One of the great attractions of WoW to me at least has always been the little things, the pop culture references, the jokes and the interactions between NPCs so when I saw this, I couldn’t stop myself smiling and singing away. 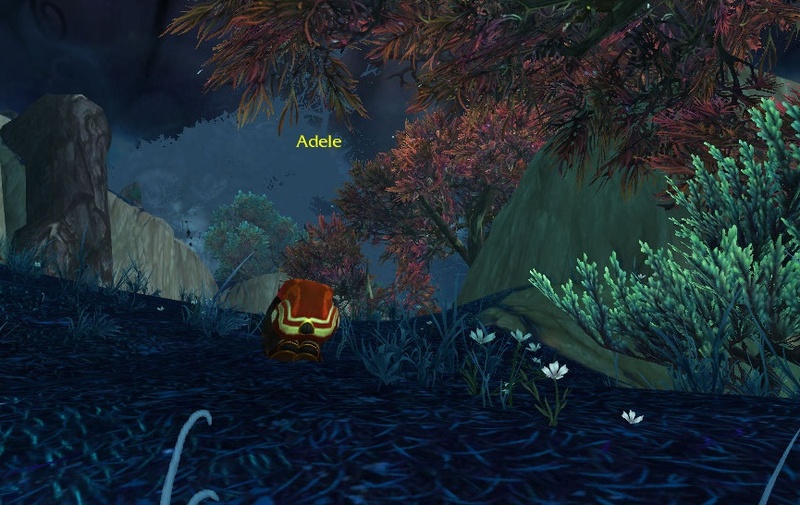 Yep, that’s a Panda called Adele and she’s rolling in the deep, the Widening Deep to be precise. Suggested by Syl of Raging Monkeys. I love this topic so much, I’m going to share a couple of my favourite hidden things with you. 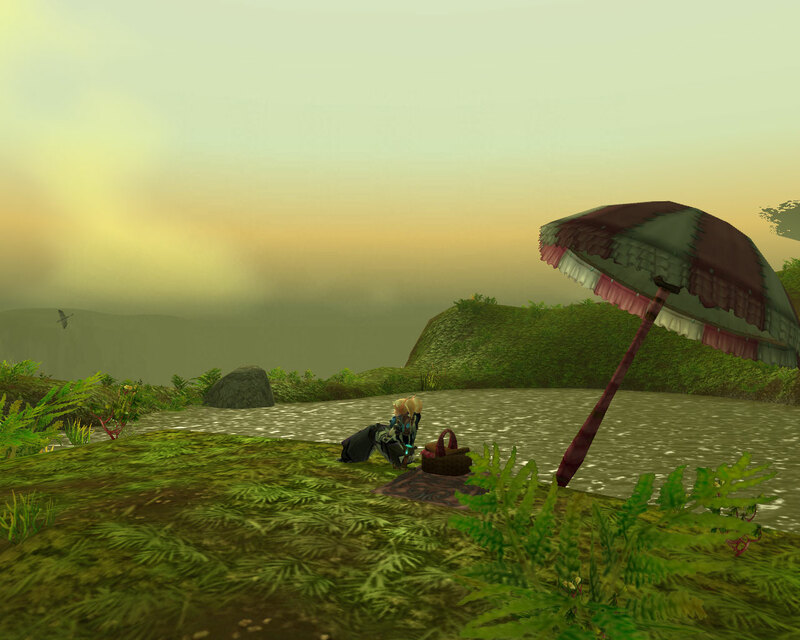 First of all, the best location in the whole of Azeroth. Up high, where the mountains touch the sky, you can sit, relax and look down on the world spread out beneath you. 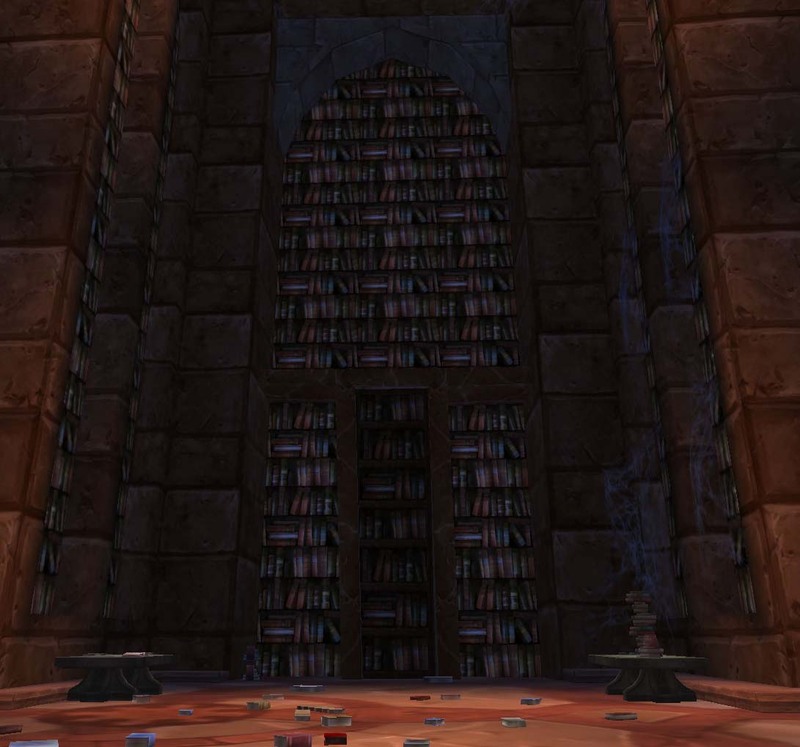 When I first started playing, I was so in awe of this world, I talked to every NPC I could find. Some with better results than others, for example Sergra Darkthorn really wasn’t happy to see my little human warlock wandering through Crossroads looking for polite conversation. 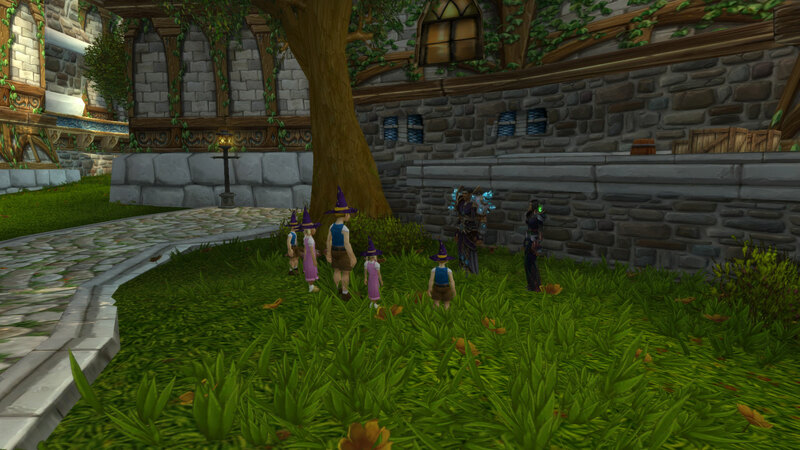 We were heading through Feralas on our way to Feathermoon Stronghold for the very first time, I think so I could learn the next alchemy recipes when we spotted this female nightelf standing by the way side. Being the type of heroes who rush to the rescue of people in distress, we naturally left the path to ensure she was alright. However instead of asking us to retrieve her lost luggage or kill some marauding bears for food, she wanted to send us up a mountain. A little dubious as there were no ladders or any other visible means of ascending, we accepted her quest. Whoosh, one minute we were standing with both feet firmly on the ground and the next… it was as if some whirlwind had picked us up. “The land of Feralas has been through much, human. The earth, the trees, the creatures; they are all changing what Feralas is and will be. Here I am sitting at the top by the pool and watching the sky. Once you are up there, the only way is down but you don’t just have to hurtle to your death, unless you want to of course. A nightelf gentleman will sell you a parachute for a few silver, however don’t deploy it too soon as it doesn’t last long at all and those rocks hurt if you hit them head on. For mages, priests and engineers you can descend at your own pace taking in the view. Trust me, that’s a long way down. Also if you hit the rocks half way up, it can be tricky to resurrect without someone else managing to land next to you to res you or taking res sickness, so be careful. Possibly my favourite disguise is that of a Dark Iron Dwarf which comes from the best watering hole in the Eastern Kingdoms, The Grim Guzzler itself. Home to Coren Direbrew (some of the year), some of the best bar snacks in Azeroth (all the time) as well as the Tauren Chieftans, I love the bar. Especially now I have my direbrew remote, it’s my hangout spot of choice whilst forum reading. 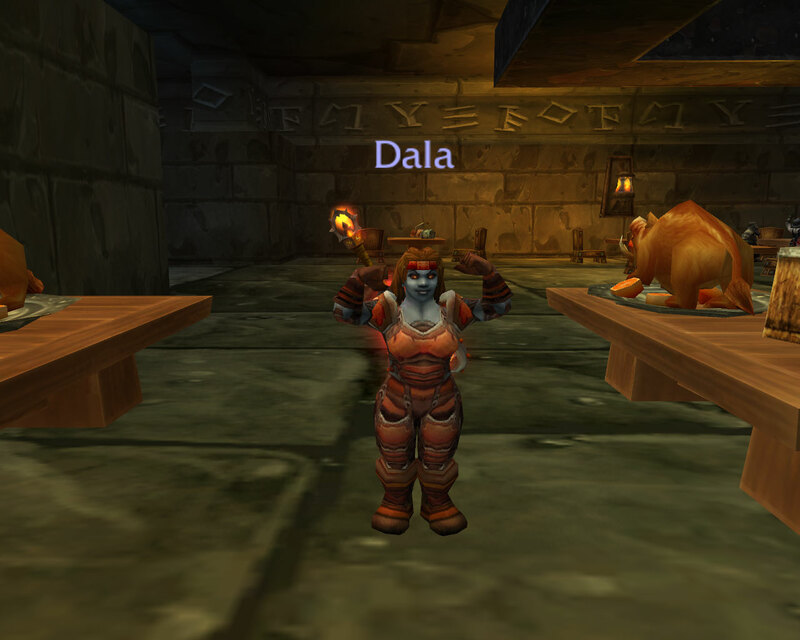 Whilst I’ve never managed to play a Dwarf beyond lv 5, I love their animations and so this is my substitute. Standing at the back of the Bar is a gentleman called the Dark Iron Brewer. He’s neutral to both factions and has a couple of pages of dialogue for you to work through. Once you’ve read it all, he drops a flagon of beer on the ground. Drink it and you become a Dwarf. Unfortunately they don’t stack so you’re limited to one in your bags at once but you drink one and pick another up for later. The disguise doesn’t last after death either. From a spot of experimentation, it seems as if the Dwarf you become is down to armour specialisation rather than anything else. For example every caster I’ve tried, regardless of class and faction ends up looking like my Priest above. Druids and I think rogues get this model and so on. Finally, my favourite item of clothing tends to be a bit of a secret too, at least if you only play the Alliance. The sleeveless t-shirt only drops from Alliance corpses (includes players) inside Alterac Valley. 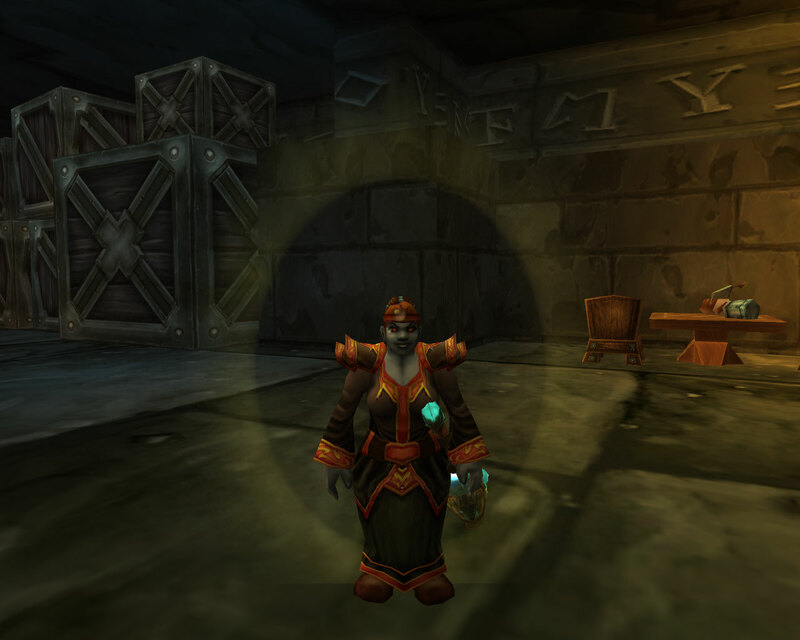 The flavour text reads “On the inside collar it reads, “Inspected by Earl Z. Moade.” All my characters wear them with pride even though they’ve been around since the early days of AV, when you could argue that the Horde possibly had a slight advance over the Alliance as they could jump into the Dun Baldar bunkers and their choke point was considerably more choking than the Alliance version. Here you see my Priest modelling a sleeveless T-shirt and a ripped ogre loin cloth. I’m guessing there must be a lot of safety pins around the back holding it together as there is a bit of a size difference between a Bloodelf and an Ogre. 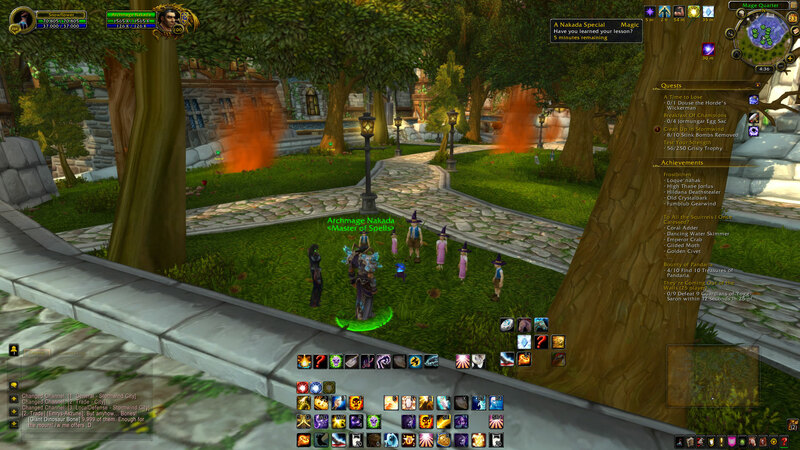 This is one of the reasons I’m really looking forwards to Cataclysm. Exploring and hunting down new quirky things is up there with killing a boss for the very first time. 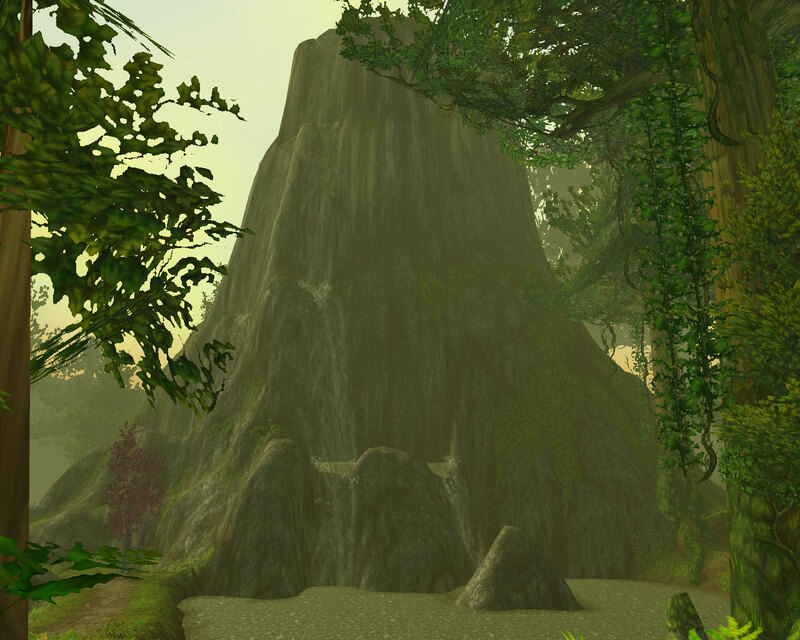 Take the wild wet ride from Blue Sky Logging Grounds to Venture Bay in Grizzly Hills. 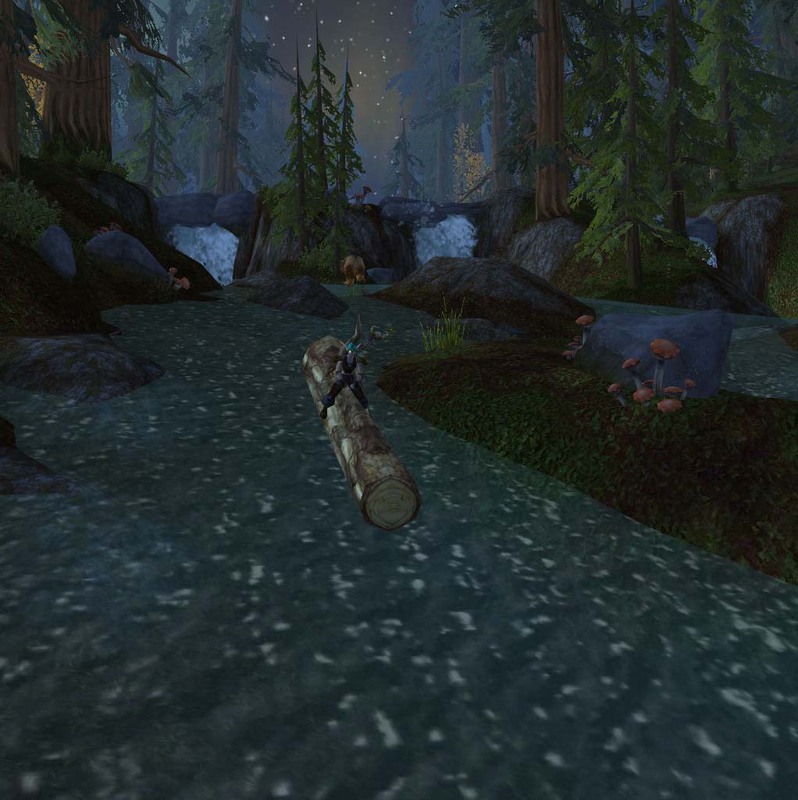 Besides myself (I do this far too often) I haven’t seen a single other person go flying down the river on a log, so next time you play WoW… take a detour to Grizzly Hills. The Alliance need to talk to Gordun and just across from him, the Horde can find Darrok. The happy smiling face on the timber is just the icing on the cake. 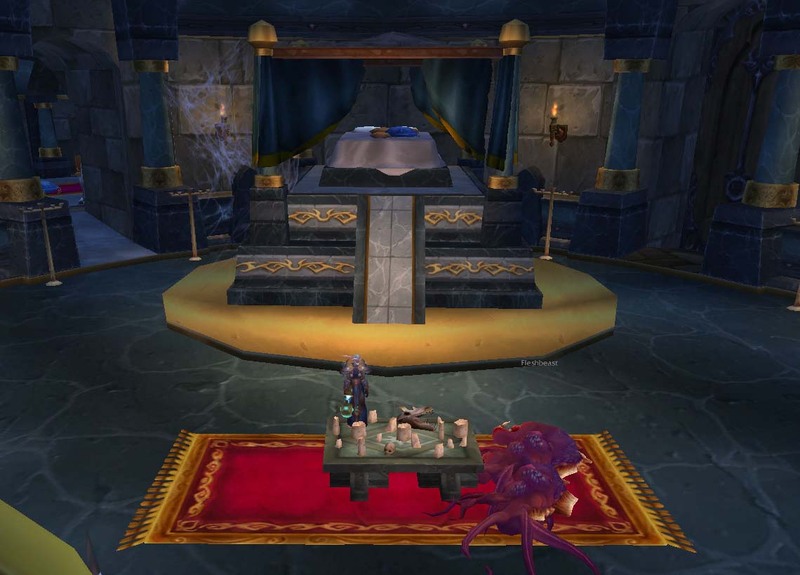 Too many quests in Warcraft are the generic fetch X, kill Y or go to Z. Little to no real explanation is offered and we as the perpetrators of countless awful acts rarely see any negative effects as the result of our actions. We just slaughter our way through the world, picking up gold and second hand cloths without a care in the world. 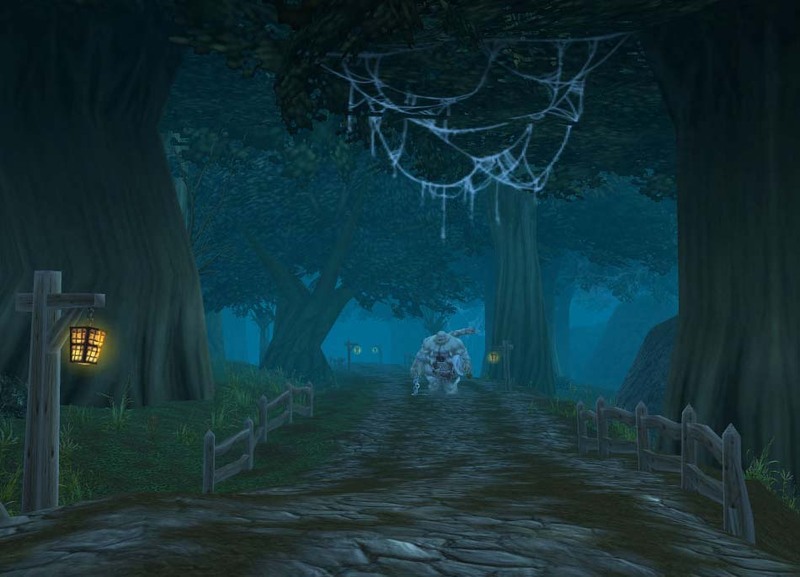 The chain which leads to Stitches the Abomination being let loose on the good people of Darkshire is a step beyond that. First of all, we are trying to help a community under siege rather than just committing random acts of violence. Running errands, catching proven murderers (Stalvan) and making a stand against the wandering dead. Ok, our motives probably aren’t 100 percent pure. No reward, no dead ogres, worgen (wonder if when they become a playable race, we’ll still be able to skin all the NPC ones) or undead. For once, we are fighting the good fight and yet in our naivety we manage to cause even more chaos. Then once he is lumbering towards the town, you get the build up. The Watchers running out to try and block his path (of course they die pathetically) and the people of Darkshire panicking as yet another evil heads towards them. I think this is definitely a contender for my favourite quest chain in-game and well worth doing, if only to watch the ensuing havoc. A word of warning though, stay clear of the road if you’re low level whilst he’s rampaging towards town. 12k health is a lot for lv 20s to cut through and he hits like a truck.